A group of young Japanese snap selfies as they knock back a few drinks on a Friday night. But the backdrop to their photos is a mechanical claw stuffed with trash. They have chosen one of the more unusual spots in Tokyo for an after-work tipple: a local waste facility and incinerator. 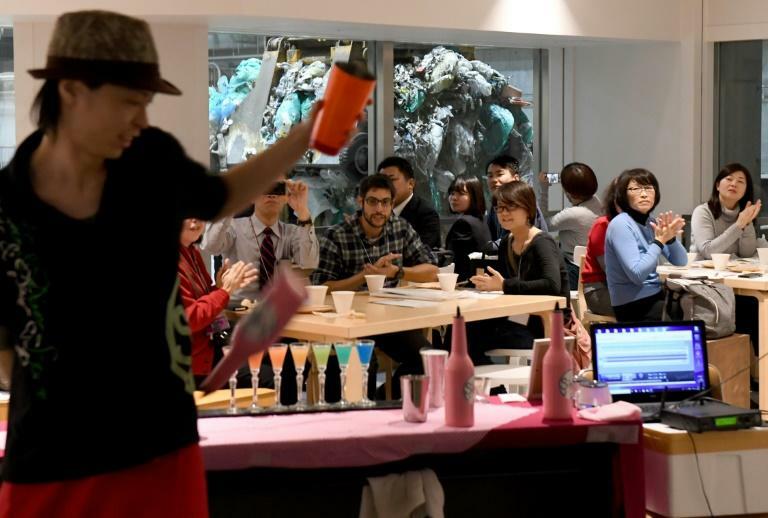 The pop-up bar -- called Gomi (trash) Pit -- is the initiative of local officials who are trying to promote their state-of-the-art facility and prod local residents to think about the waste they produce. It makes for a striking juxtaposition: on the upper floor of the facility in Musashino in western Tokyo, several dozen people sit at tables eating nibbles and sipping cocktails. The glass windows in front of them look directly onto a deep pit where tons of garbage is piled for incineration. Every few minutes, an enormous crane descends to the bottom of the pit, then raises up gripping the detritus of daily life: half an Ikea bag, a tie, pieces of cushion foam, torn paper, and plastic bags of every description. The claw opens to release and mix the trash -- key to ensure the various components burn evenly in the incinerator -- and the pieces dance down through the air, like the most unpleasant snow imaginable. 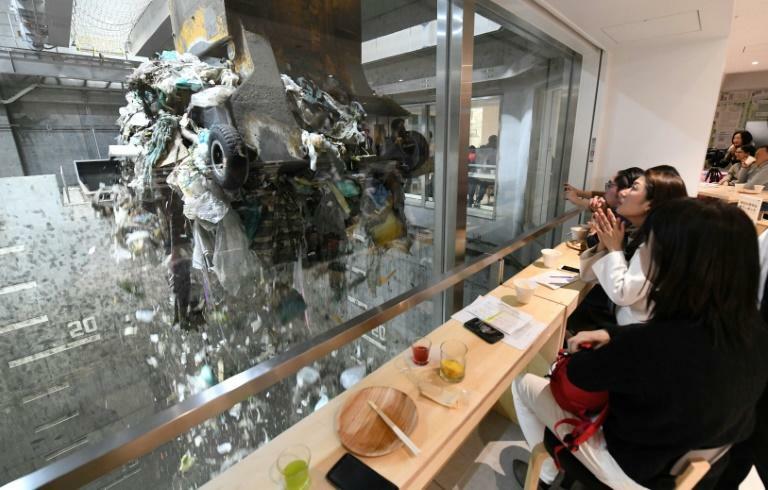 "It's kind of surprising," said Isao Tomioka, 49, looking at the swirling waste falling behind the glass. His two daughters, aged six and four, were pressed up against one window watching. "There is some garbage which cannot be burned at all, that garbage must be piled up somewhere, which means that for them it's a kind of negative legacy from our generation," he said. Musashino already requires residents to sort their waste into several categories -- a common practice in Japan -- and also charges for the garbage bags that local authorities will collect. It's a way to encourage people to minimise waste, but local officials hope exposing people to the sight of the accumulated trash will have an even bigger effect. "Many visitors have expressed surprise. They say they had no idea how the waste they produce is being processed," said Ayana Seki, an official with the local environmental department. "Many people also say that they were shocked to see so much waste being piled up although each household puts out only a bag or two of trash." Tomioka said he already carefully adheres to local rules about separating his waste, but seeing the facility made him feel he could do more. "I would like to streamline my consumption," he said, balancing his younger daughter on his hip. "I love cooking, for me it's one of my favourite hobbies... from now on I'm going to try to minimise food waste. That's my decision after seeing this." Gomi Pit is only temporary, but the Musashino Clean Centre facility is open to visitors year-round, and was designed to encourage people to come in and look around, Seki said. When they began planning the centre, which opened in 2017, they wanted to overcome potential local opposition by creating a place that would be seen as positive. The facility is designed to be attractive, with wooden slats along the facade to mask the concrete shell, and windows at eye level to invite curiosity. 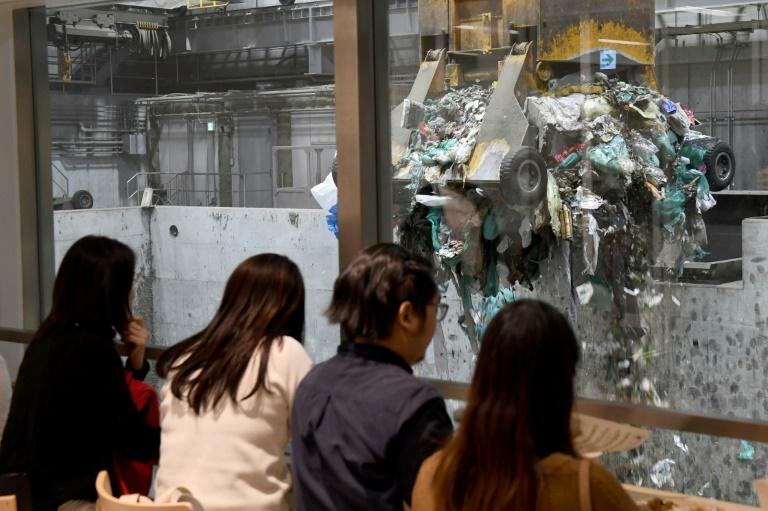 Each area is labelled in Japanese and English, and the control room has floor-to-ceiling windows on one side so visitors can watch technicians remotely handle trash and monitor the facility. One of the windows even doubles as a touch screen: pressing different icons brings up information including the incinerator's temperature and the amount of trash burned that day. The facility didn't come cheap: 10 billion yen ($91 million) to build and another 10 billion to operate over the next 20 years. But local resident Yukiko Ota, sipping a lurid blue concoction from a miniature glass, said the visit had made her think. "This place is really neat and doesn't smell at all!" the 49-year-old housewife said. She said she had been surprised to learn that items that can't be burned are landfilled elsewhere in the country. "We are imposing the burden on some other town," she said. "We should try to reduce the amount of waste we produce."